CCO or Chief Compliance Officer is the officer who is responsible for overseeing as well as managing regulatory compliance issues in an organization. According to the study conducted by Gartner, 41% of United States corporations had a designated Chief Compliance Officer in the year 2010. And, it is said to multiply in the future since the industries have become more concerned about compliance because of the rigorous and complex legal necessities. Blue Mail Media’s CCO Mailing List helps you to reach the key decision makers of various industries across the globe. That is, with the help of our list, you can have seamless interaction with the CCO’s of sectors such as Oil and Gas, Automobiles, Real Estate, Telecommunication, Manufacturing, Finance, Travel, Pharmaceuticals, Healthcare, Technology, and others. So, join us, avail our GDPR compliant list and see the result by yourself. Blue Mail Media, a popular data solution provider, offers you the best email list for your business activities. 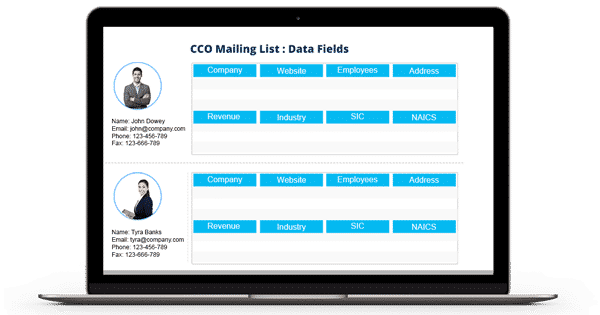 Our CCO Executives Mailing List comes in a pre-packaged as well as the customized format that lets you reach the right prospects at an appropriate time with no hassle. You can trust our database since our team collects the data from authentic and internationally trusted sources such as business directories, yellow pages, conferences, trade shows, business meetings, government records, surveys, and more. Besides, they invest significant time and effort to update it on a regular basis. Data scientists make thousands of verification calls as well as send verification emails to ensure its reliability and accuracy level. Hence you can fearlessly buy our Chief Compliance Officer Email Database that is free from errors and redundancies. Apart from this feature, our list lets you meet the prospects in various regions across the globe. The places include USA, UK, Europe, Russia, Africa, North America, South America, Asia, and others. Therefore, don’t compromise your marketing campaigns with outdated or incorrect data. You can improve your conversion rate and ROI with the help of our CCO List. Buy it now and boost your sales rate efficiently. Dial 1-888-494-0588 or send an email to sales@bluemailmedia.com for any queries! Our team of data scientists, analysts, and experts constantly dig out the most qualitative data to power your multi-channel marketing strategies. Also, we ensure that our List of CCO Email Addresses remains accurate and updated by making thousands of verification calls each day and sending out verification emails.